Currency markets are again focusing on the gaps in economic policy that are opening up across the major economic areas. We see the Federal Reserve on track for an interest rate hike in either October or December, with the Bank of England following suit in February of 2016, while other G10 central banks remain overwhelmingly in easing mode. The combination of expected monetary tightening from the Federal Reserve and a Chinese economic slowdown, which was starkly brought to the fore by the Yuan devaluation, has caused a sharp sell-off in most currencies from emerging markets, in many cases to all-time lows. Commodity exporting countries have been particularly affected, given oil prices are currently hovering around six year lows. While the economic slowdown in these countries is undeniable, we think the recent falls have left many of their currencies at very cheap levels and this is starting to offer compelling value. Their macroeconomic vulnerability to gradually rising interest rates in the US. The extent to which the recent sell off already devalued the currency and whether this is enough to increase competitiveness and compensate for any deterioration in the terms of trade. Read on for in depth analysis of the emerging markets, their economies and their currency fluctuations. 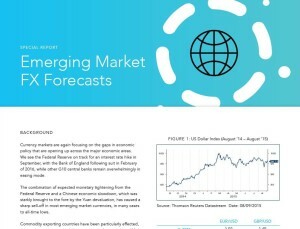 The report has been produced by Chief Risk Officer Enrique Diaz-Alvarez, who forecasts for Bloomberg and is regularly quoted across economic publications, such as the FT.